Owners Steve and Nancy Scagnelli opened Esteban’s in 1974. 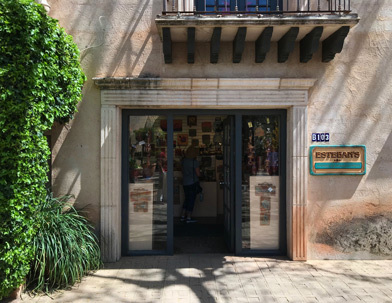 It was one of the first shops in the newly built Tlaquepaque Arts and Craft Village. 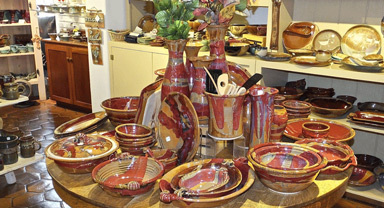 Originally, Steve made all the pottery for the shop, and his unique line of carved vases and jars is still a mainstay of the gallery. Over time more and more artists were added to the store, and today Esteban’s represents over fifty craftsmen, mostly from Arizona and other southwestern states. 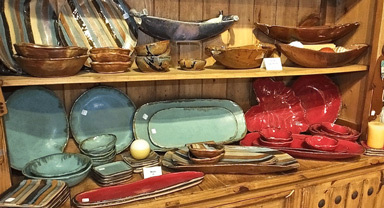 Esteban’s features a wide variety of functional pottery pieces – everything from mugs, bowls, casseroles and chip and dips to large serving platters. It’s all lead free, dishwasher, oven and microwave safe for your everyday enjoyment and use. Esteban’s also offers an array of decorative vases and jars, brightly colored raku vessels, hand built sculptures, wind bells and wall art to decorate your home or garden. Our friendly staff is ready to help you pick out just the right piece for your home or as a gift for someone else.